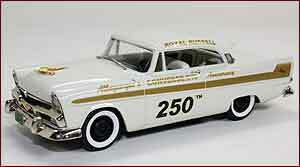 1956 Plymouth Fury in Pikes Peak Hill Climb livery, Factory Special licenced by The Chrysler Corporation. Product number: BRK63 also known as FS03. Brooklin Models 1955 Plymouth Belvedere 4-Door Suburban. American car-buying public were treated to brand new body styles and new colour schemes which saw sales figures soar. Two door, four door, hardtop, convertible and station wagon options were offered and the Belvedere Suburban was the top of the line wagon. Our model is finished in Mohave Brown Poly.